How to Get Cheapest Malaysia Price for Redmi Note 4 (Gold) 3GB / 32GB @ Lazada Malaysia? 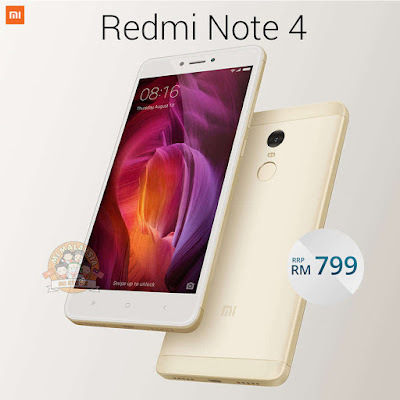 Use Maybank Cards during checkout to get lowest best price for Redmi Note 4: RM703.12 (12% Discount) Using Lazada mobile app or RM719.10 (10% Discount) Using Lazada desktop website. 10% OFF on Lazada desktop website. 12% OFF on Lazada mobile app only. Only valid on every Wednesday. Only items with Maybank Stamps is valid for discount. No minimum spend or voucher code required. The discount is not valid in conjunction with any other offer, discount or promotions. Products exclusion may apply. Discount is applicable for Maybank cardmembers. Payment must be made with a Maybank/ Maybank Islamic MasterCard or Visa Card. LAZADA reserves the right to alter, cancel, terminate or suspend the Promotion or any part thereof or any part of the applicable terms and condition from time to time, with or without any prior notice.